[Russia : publisher not identified], 7159 [i.e. 1651]. Skazanīe o volʹnom stradanīi gospoda nashego Iisusa Khrista. Sbornik” sobrannyi iz knig” sviashchennago i sviatootecheskago pisanii, tvorenii sviatykh ottsev I uchitelei tserkvi I vnieshnikh pisatelei. Harvard College Library has recently acquired a collection of 6 rare Old Believer books. 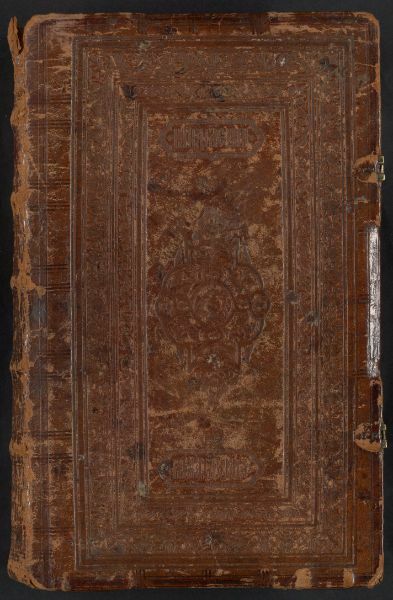 The value of this acquisition is determined not only by its great physical condition but also by the fact that it illustrates different chronological periods and publishing methods pertaining to the history of Old Believer literature. 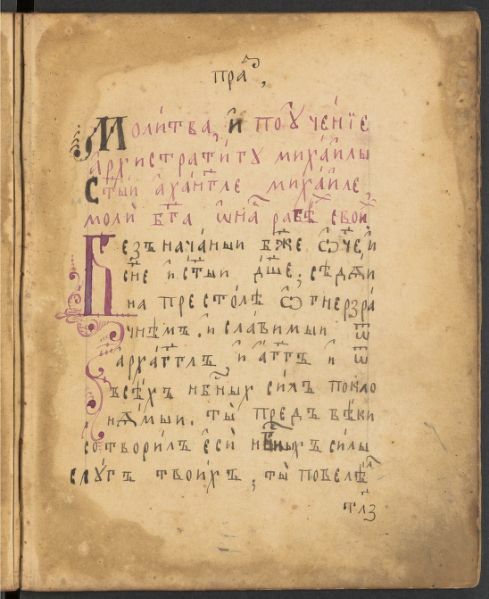 The set includes one item published in 1651 (i. e. prior to the Patriarch Nikon’s church reform that led to the break between the official Russian Orthodox Church and the Old Believers, who remained faithful to the pre-Nikonean rite.). 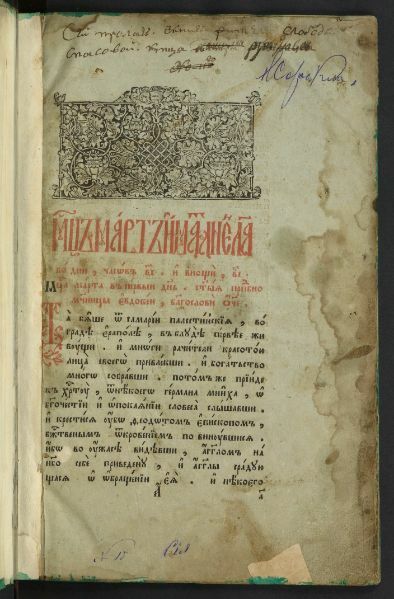 This book (Kanonnik”) serves as an example of a title that while not created by the Old Believers, was nevertheless considered by them as part of their religious and literary heritage. 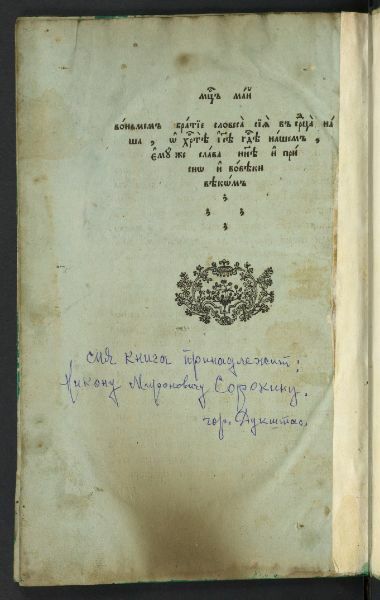 Another gem of the collection is the 19th century handwritten Skazanīe o volʹnom stradanīi gospoda nashego Iisusa Khrista (a retelling of the passion of Christ based on the later chapters of the New Testament). The book is written in in black and red ink and decorated with ornamental headpieces. 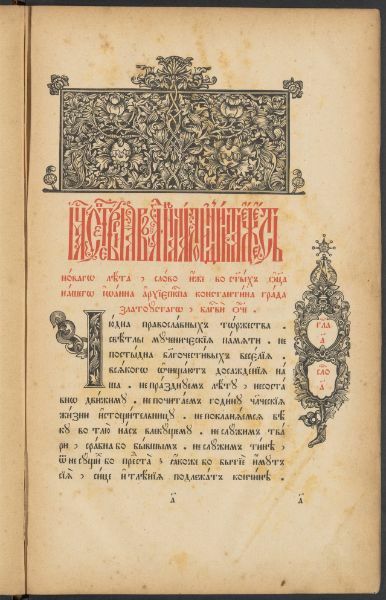 Another 19th century item is a later copy of Trefologion, tretʹi͡a chetvertʹ (mart–maĭ) [Trefologion for March-May], mentioned by A.S. Zernova in her Knigi kirillovskoi pechati, izdannye v Moskve v XVI-XVII vekakh, under number 139. 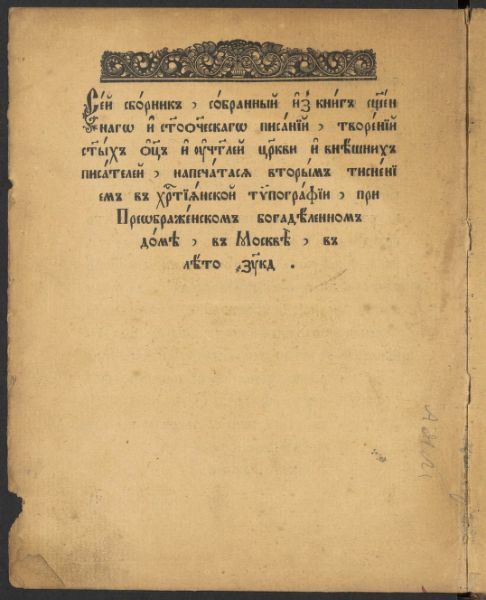 The collection also includes 3 books in popular Old Believer genres of Torzhestvennik, Kanonnik and Sbornik, published in 1911-1916 by the Old Believer Preobrazhenskii monastery in Moscow. The complete collection has been digitized within the framework of the Harvard College Library preservation digitization program. In an effort to provide the most complete visual information on these items we created scans of complete books, including the covers, spines and lining papers, as well as any owner’s ephemera found inside. I would like to thank Michael E. Biggins (University of Washington) and Olga Strakhov (Harvard University) for their assistance with research for this project. “English” PDF Version of these books available ? Dear Ebin V Thomas, thank you for your question! These books have been photographed in high resolution for the benefit of our users. The images can be saved as PDFs, but no OCR or English translation is provided. Thank you again for your interest! Спаси Христос. Есть еще книги староверцев?/Save Christ. Any more old believers ‘ books? Добрый день. Насколько можно судить по нашему каталогу, их у нас немного. В книге “Торжественник” (https://iiif.lib.harvard.edu/manifests/view/drs:432634365$1i) отсутствуют оборот листа 113, (славянскими буквами, число- ΡΓΙ) и первая сторона листа 114 (славянскими буквами, число- ΡΔΙ). То есть, эти две пропущенные страницы должны размещаться после страницы №238 электронного варианта книги, размещенного на сайте. Добрый день! Спасибо за ваш комментарий. Действительно, похоже, что лист 114 совершенно отсутствует в нашем экземпляре книги. Мы проверим физический экземпляр, и сделаем соответствующую пометку в библиографической записи. Здравствуйте. Подскажите, возможность предоставления книг в формате PDF, в частности, книги “Канонник” (https://iiif.lib.harvard.edu/manifests/view/drs:434757456$1i) не работает вообще или по каким-то иным причинам? Почему-то не приходят PDF-файлы на указанные мной почты. Спасибо. Спасибо за ваш вопрос. На почту должны прийти не сами файлы, а ссылки на них. Вы их получили? Мы только что протестировали этот процесс, все работает.